Very often, in any and every sports, there are matches that are so close, that you really wish that both the competitors win. This happens in pageants too! At times there are few delegates who are so strong in terms of beauty and overall performance that long after the pageant is over, people still find it interesting to discuss whether the right choice was made by the judges. This has perhaps happened in every pageant. In Miss World, it happened in 2013 when Megan Young of Philippines won. There are many people who still believe Marine Lorphelin of France should have won. She was the first runner-up. In fact, even in Miss World Philippines pageant that year, Janicel Lubina who was recently chosen as Miss Philippines International 2015, finished second to Megan Young and there are many who feel that Janicel deserved to win that year itself! In Femina Miss India 1994, Sushmita Sen won over the hot-favorite Aishwarya Rai. In a short span of time, Sushmita re-affirmed her competence when she won the Miss Universe title, thereafter shutting the mouths of all who said Aishwarya deserved to win over her at Miss India. 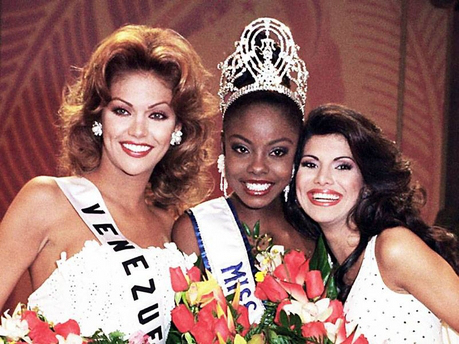 Like these, there is one more eternal debate – whether Veruska Ramirez should have won Miss Universe 1998 instead of Wendy Fitzwilliam? Wendy Fitzwilliam of Trinidad & Tobago was a hot-favorite to win the contest. Her height and magnificent presence helped her stand out easily in the sea of 86 beauties. She won the national costume contest with her carnival dress. She looked amazing in it! In the finals, her presence in the Top 10 was obviously quite expected. She easily topped the interview with her confident answers. Her voice was mesmerizing and she positively potrayed Japan as a country (her interview was based on her rendezvous with Miss Japan about her country). Her score was a whooping 9.717 which was way above the second placer Miss India. In swimsuit competition, Wendy finished second with an amazing score of 9.762. In perhaps any other year, she would have won the swimsuit round. Her tall, lean frame and amazing presence in the black bikini filled you with awe for her. Now Miss Venezuela was giving some competition to Wendy. However, Wendy sweeped the evening gown round with the top score 9.835. She looked absolutely elegant and stunning in the white gown and carried it with grace that is really at a very high bar even by Miss Universe standards. By the end of three rounds, her average score was 9.771 which means she made it to the next round. In the Top 5 interview round, Wendy got the chance to sing. By this time, Wendy had established herself as a favorite and people tend to love whatever the “successful ones” do. In any case, Wendy did well in the interview round. She got the highest score and made it to the Top 3! Veruska Ramirez of Venezuela had a rags-to-riches story about her life which made her popular among everyone. She looked like a stunning barbie doll and that helped too. Of course she had to make it to the Top 10. It is interesting to note that in Top 10 Trinidad & Tobago was announced 7th followed by Venezuela at 8th spot. Now this definitely can work against Venezuela because she is preceded by the hot favorite. In interview round, she showed few dance moves and spoke about “lack of” fashion trends in Romania. Her confident communication skills & charm helped her score 9.423 and overall a third spot. In swimsuit round, she looked “perfect” in the bikini and earned a score of 9.855 which was above that of Wendy. Now people were able to see the fight between the beauties. In the third round, Veruska came out in beautiful white gown and looked absolutely ravishing. Her score was 9.720 and she finished second. In any case, Veruska gave superb competition to Wendy and finished overall second in three rounds with score of 9.666. In Top 5 interview round, Veruska continued to impress everyone and finished second, thus making it to the Top 3! In Top 3, the question was that if a woman is asleep for 20 years and then she wakes up, what would you tell her she missed? Miss Venezuela said that she would tell her you wasted a lot of time sleeping and now you should try to fulfil all the dreams that you dreamed when you were awake because it is possible to achieve all your dreams. Miss Trinidad and Tobago said that the girl missed a lot in terms of technology, good climate, etc.. While this seemed like a bizarre question, the answers to the question were definitely not really superb and that is understood. I feel the questions at this stage of competition should be moderate in difficulty level, at least not very tough. Venezuela got the highest score of the evening in the swimsuit round. In my humble opinion, Miss Venezuela actually made more sense in her final answer because she not only mentioned that the girl missed a lot due to sleep, but she also gave solution saying that now she should try to fulfill all dreams that she has. On the other hand, Miss Trinidad & Tobago said about things that she missed and that too not clearly. There was no positive twist or “lesson learnt” aspect to this. Hence, if it had to be just on the final answer, I feel Venezuela should have been the winner. However, the winner is to be chosen based on overall impression too. Perhaps the winning aura of Miss Trinidad & Tobago could not be denied. She had performed like a winner the whole night and she did have a slight edge over Veruska before the final round. And that is why Wendy won & Veruska had to settle as the first runner-up.